2 large sacks, 2 small sacks, waterskin, fishing line & hooks, 4 snares, 2 medium jaw traps, set of skinning/tanning knives, 6' light chain, 30' rope, 5 wooden spikes, small mallet, mirror, hatchet, lantern, frying pan, and tinder box. Jidian’s full character sheet is here. All adventurers, great and small, who hail from the northern parts of Palladium have heard the name of Jidian Kulder. He is one of the finest rangers who have ever trodden the Northern Wilderness. He is a human friend of the Wolfen, but loved by humans as well. 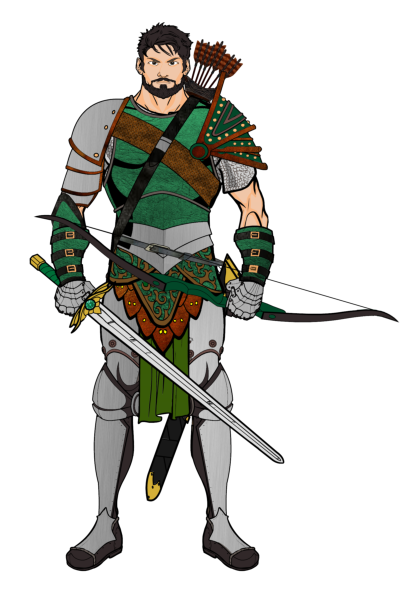 He thwarted an attempt on King Avramson’s life, received accolades from the Eastern Territory for his defeat of the Brass Crown Coyle clan, and has fought for good in the Timiro Kingdom, the Floenry Isles, and has recovered historical texts for the Library of Bletherad. He is wanted by many in the Western Empire for his repeated destruction of slaver parties. He is the leader of the Legion of Northmoor. He is one of the only men to ever return alive from the Land of the Damned, which he and his core Legionnaires do! They then take up the mantle of destroying the Glaive of the Old Ones. CrIsis helps Jidian recover the Glaive of the Old Ones, and rescue Sister Gaia. See the logs A Letter to the Library, Deevil Dark Distraction and the Snore Heard Round the World, and Roggan’s Other Other Other Log for more.